OK, the home workshop is built – now I want a clock for it. A simple ask, you might think. An automotive theme might be nice – a vintage Castrol clock, or the like. But as I soon found, unless you have very deep pockets, you can forget about clocks like that. Hmmm. So what’s actually needed? Well, firstly, a big clock – one that can be easily read from 15 metres or more. Next up, a battery-operated clock so that it doesn’t need to get reset after every power failure. Then it’d be nice if it lasted a decent length of time – so something with a quality movement. 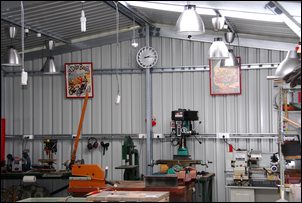 And as I said – something that suits a home car workshop. But would you believe that I could find nothing that - at a low price - met these criteria? Like, under $50? So I decided to make my own. 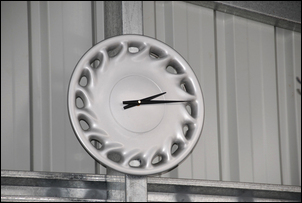 I decided the go for the hub cap, as the background of the clock face would be more uniform (making it easier to read the position of the hands), the clock would be light-weight (and so easy to hang) – and getting a plastic hub cap would be cheap and easy. I visited the local wrecker and decided to grab a generic aftermarket hubcap. As I am not an enthusiast for any particular marque, that kept it automotive but anonymous. I also thought the blandness of the aftermarket hubcap would suit its new application. Five bucks later, it was mine. 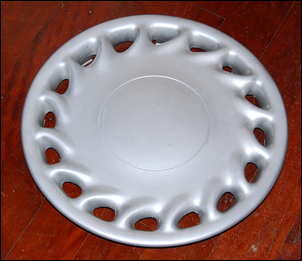 The hub cap (or wheel trim) is to suit a 14 inch wheel and is actually 15.5 inches (~39cm) in diameter. That’s a big clock! 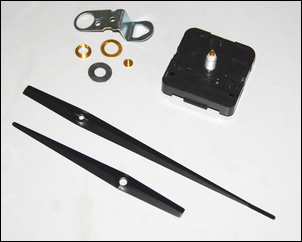 Quartz clock movements are available from a variety of sources – including just buying a cheap clock and pulling out the guts. But for two reasons I chose not to take that path. Firstly, I wanted the clock to last, and secondly, removing clock hands (and then later re-attaching them!) is often a lot harder than it sounds. Instead I bought a Takane ‘slimline movement’ from Jonathon Knowles Clock Co. This costs AUD$10 and is guaranteed for six years. Included is a free set of hands – and, importantly, you can pick from a variety of hands to suit your application. I chose thick, black hands 152mm long (well, the 'minutes' hand is that length; the 'hours' hand is proportionately shorter). With freight, the total cost was AUD$18.80; the well packaged parcel arrived within a few days. It contained full instructions. You can also buy clock face numbers and dots from the same source, but I reckoned it would make it a lot harder if I had to get numbers and dots distributed evenly around the hub cap. Plus, I don’t need to read the clock to the minute, so the general orientation of the hands is sufficient. The first step was to wax the hubcap with normal auto wax. This brought up the shine and took off a few tar marks – although, if you look closely, you can still see some scratches. But I won’t be viewing the clock close-up. Next, I drilled an 11mm hole in the centre. (Well, the instructions say 11mm but I think a smaller hole would be fine). The mechanism was then inserted through the hole, a nut done up (no other attachments are necessary) and the hands pushed on. Put in a single AA cell, set the time, hang it up - and that’s it! I figured that making the clock might be a 20 or 30 minute job, but without numbers or dots, it took less than 2 minutes from start to finish. OK, so it’s not the most elaborate of clocks, but it works, was quick, easy and cheap – and it has the right theme. I love it!